Quick refresh on one way to manage a Mongo database for access by Python programs. Set a directory to store the database. Let’s call this /mnt/mongodata. docker run --name mongoserver -p 27017:27017 -v /mnt/mongodata:/data/db mongo. the “-v” flag maps the local directory to the /data/db directory in the container (where Mongo stores its data). When using Docker Compose and building more advanced systems it is recommended to use named volumes. The problem with named volumes is that all the data is stored in “/var/lib/docker/volumes/” and I have some big databases that mean I’m constantly running out of space. One solution is to maybe mount a logical volume to “/var/lib/docker/volumes/” before creating the volumes that is managed separately from the “/” logical volume. Or understanding how to best use Docker. Docker is a great way to build services with modular and changeable components without borking your server / computer. I like to think of Docker containers as a system version of Python’s virtual environment – you can build a stack of services and applications through a Docker file, and then easily use this on different computers. However, Docker can become an amorphous blob if you are not careful. Containers and volumes can multiply, until your computer starts freezing because you have used up 100GB of space. Images are like ISO disk images, the difference being that they are built layer-by-layer such that layers may be shared between images. An image may be thought of as a class definition. Images are created when you issued a docker build command. To organise them make sure you build an image using the -ttag option (e.g. -t image_name). Images are normally identified by an ID in the form of a hash, so giving your image a name is useful. To view the images on your computer use: docker images . Containers are the computers that are created from images. They can be thought of as virtual machines, or of instances of a class definition. One image may be used to create multiple container instances. A container is created when you use the docker run command and pass an image name. I recommend also using the --name option to create a name for your container, e.g. --name my_container. Running containers may be viewed using the docker ps command. What took me a while to work out is that stopped and exited containers are also around. These can be viewed by using the -a option, i.e. docker ps -a. Another tip is to use the --rmflag to automatically remove temporary containers after use. Beware though: removing a container will also delete all data generated during the running of the container, unless that data is stored in a separate volume. Containers are really designed to be run as continual background processes. If you are working on a desktop or laptop you may want to turn your machine off and on again. If you exit a container, you can restart it using docker restart my_container. Volumes are chunks of file system that are handled by Docker. They can be connected into multiple containers. It’s good practice to explicitly create a volume, so that it is easier to keep track of. To do this use the docker volume create vol_name command. I had a problem where I had very large databases that were filling up a local solid state drive (SSD) that I wanted to move to a 1TB hard drive. The easiest way I found to store volumes on a different drive is to create a symlink (by right-clicking in the Nautilus file manager or using ln -s) to the location where you want to store the data (e.g. /HDD/docker_volumes/vol_1) and then rename the link to match the proposed volume name (e.g. vol_1). Copy and paste this in the Docker volumes directory (typically, /var/lib/docker/volumes) and then create the volume, e.g. docker volume create vol_. The volume will now be managed by Docker but the data will be stored in the linked folder. To use a volume with a container use the -v flag with the docker run command, e.g. docker run -v vol_1:path_in_container --name my_container my_image. Once you get the hang of all this a good check on disk use may be performed using docker system df -v. This provides a full output showing your Docker disk usage. Here is an example that pulls this altogether. The situation is that we want to store some data in a Mongo database. Instead of installing Mongo locally we can use the mongoDocker image. Now through detective work (docker inspect mongo_image) I worked out that the mongo Docker image is designed to work with two volumes: one that is mapped to the database directory /data/db in a container; and one that is mapped to the configuration database directory /data/configdb. If you don’t explicitly specify volumes to map to these locations, Docker creates them locally. Now these directories can grow quite large. I thus created two Docker volumes mongo_data and mongo_configwith symlinks to a larger hard disk drive as described above. To download the image and start a container with your data you can then use: docker run -v mongo_data:/data/db -v mongo_config/data/configdb -p 27017:27017 --name mongo_container mongo. The -p flag maps the local port 27017 to the exposed Mongo port of the container, so we can connect to the Mongo database using localhost and the default port. There are several advantages of using SQLAlchemy as a wrapper for an SQL database. These include stability with large numbers of data records, class/object-oriented approach, plug-and-play underlying databases. However, one under-documented disadvantage is poor change management. If you add a field or table you generally need to regenerate the entire database. This is a pain if you are constantly tinkering. There are a number of tools to help with change management. 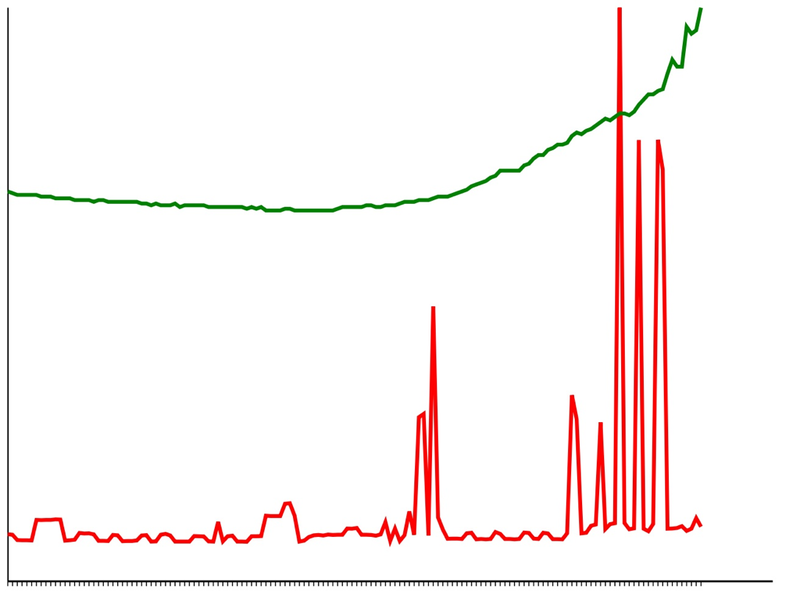 If you are using SQLAlchemy as part of a Flask application, your best bet is Flask-Migrate. This allows you to easily initialise, upgrade and migrate database definitions. Also the tutorial within the docs is great – generally this works without further modification. Alembic requires a little more set up. The documentation is good but a little intense. Wading through to work out an easy implementation is a bit of a struggle. However, once you do realise how things work it can be rather easy*. It’s a bit like git, but for databases. This creates a directory structure within your project directory. You may want to add the [dir_name] to your .gitignore file. You then need to edit two configuration settings. alembic revision --autogenerate -m "message"
*Thanks go to Mathieu Rodic and his post here for helping me work this out. 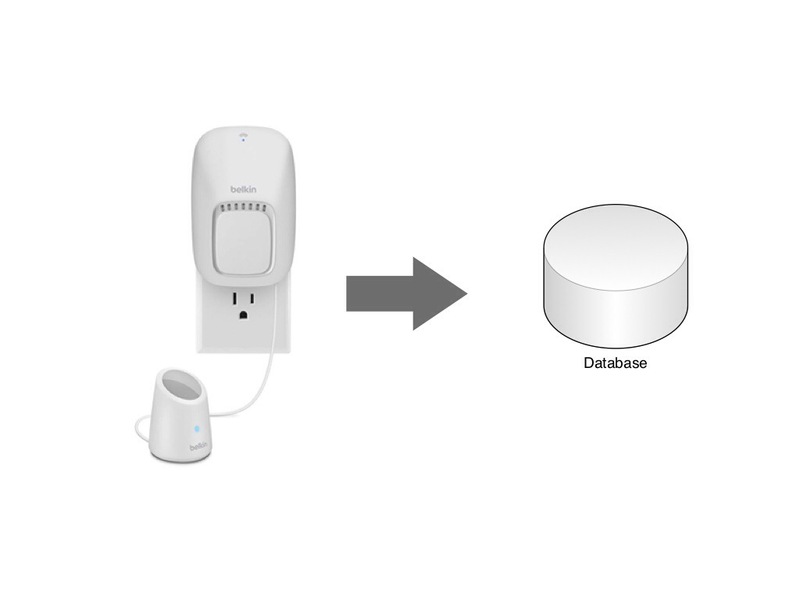 Using both the WeMo Motion rules and IFTTT allows you to do certain things with this motion detector. However, to expand our possibilities it would help if we could store our motion data and make it accessible to the programs that we write. 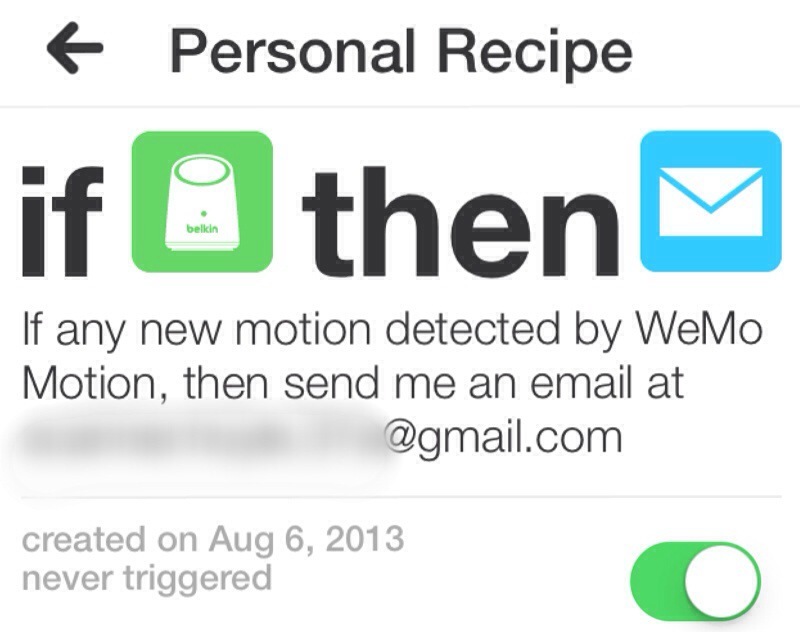 First we set up an IFTTT recipe to send an email to a Gmail account when motion is detected. I recommend setting up a separate Gmail account for automation to avoid spamming yourself with IFTTT emails. It would also make things more secure for the next steps. 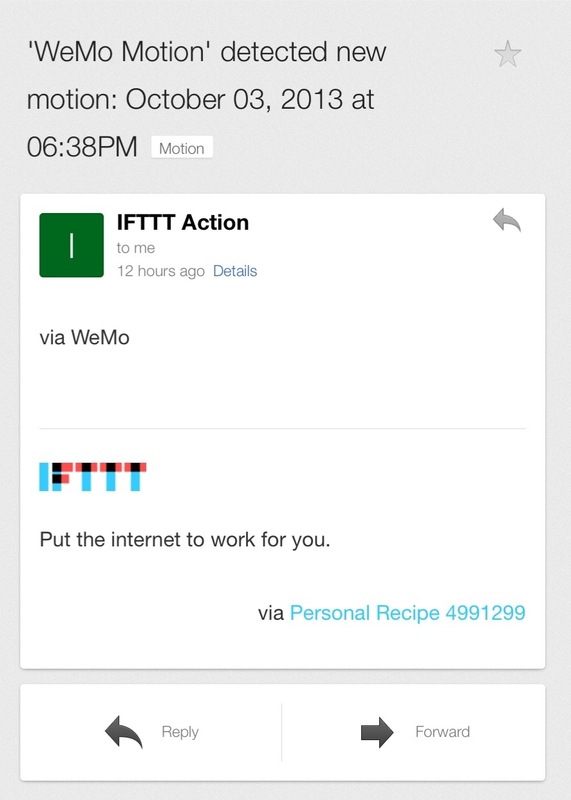 To make things easier when using multiple IFTTT recipe emails, I set up a filtering rule in Gmail to automatically label all emails like this as “Motion”. 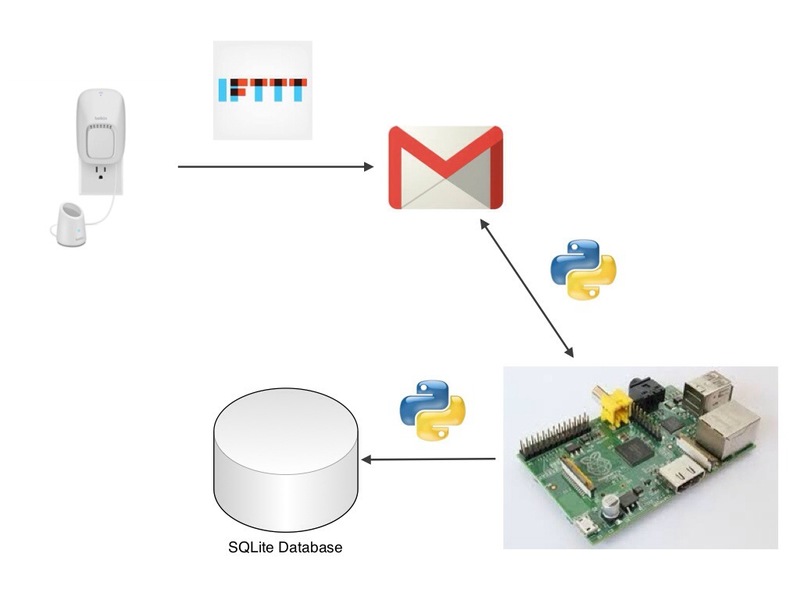 The next step is to write some Python code to access our emails, process messages and store data in an SQLite database. The database processing makes use of the sqlite3 libraries. A first function accesses all unread emails with a particular label and returns an array of the subject lines of those emails. A second set of functions then processes each subject line to extract a ‘datetime’ that the motion occurred and a motion sensor name. 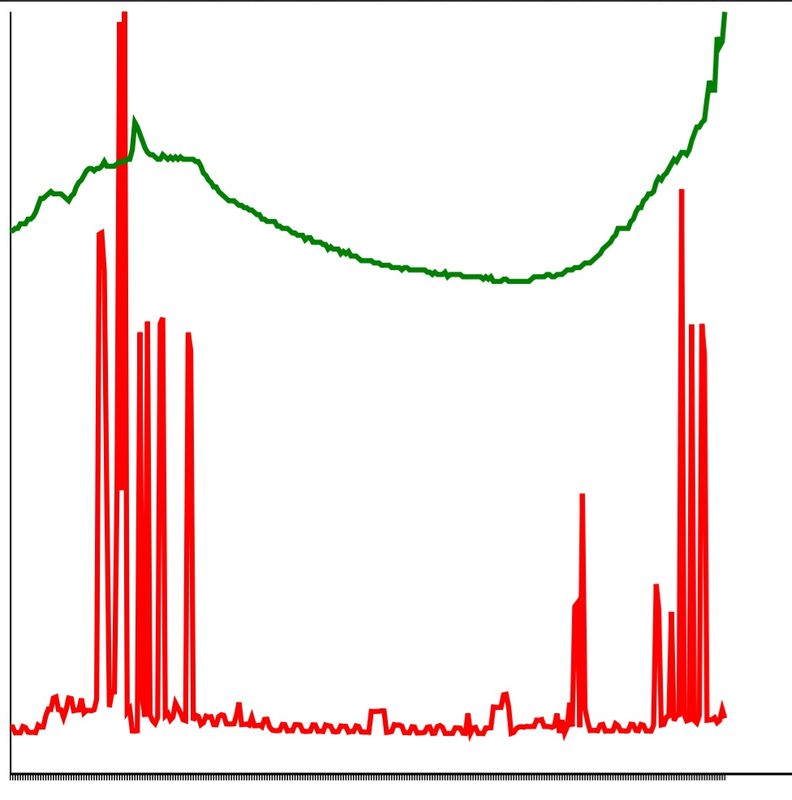 A third function stores the prepared ‘datetime’ and motion sensor name in an SQLite database. All that remains is to set these functions up in a python script and then use cron to schedule it to run every 15 minutes (crontab -e etc…).